National Guardsman Chris Webb walks Becky Brown and her husband Jerry Brown, middle right, out of Army Staff Sgt. Dan Brown's funeral Saturday, April 6, 2012 at the CSI gymnasium in Twin Falls. Jordan Brown leans into her daughter after gathering up three American Flags, one for her and one for each of her twin daughters at Army Staff Sgt. Dan Brown's funeral Saturday, April 6, 2012 in Twin Falls. JEROME • As her 17-month-old twin daughters grow up, Jordan Brown talks with them about Memorial Day. “I’ve started teaching them the meaning of today,” she said. It’s just the second Memorial Day since their father — Army Sgt. Dan Brown — was killed while serving in Afghanistan. Jordan Brown, 25, shows her daughters, Mattie and Marlee Brown, pictures of their father, who they’ve never met. They don’t grasp who he was yet, she said, but will someday. On Friday, Jordan Brown smiled as she talked about her daughters and how proud she is of them. She said they’re so smart and one looks just like her dad. Today on Memorial Day, she plans to take them to visit their father’s gravesite. Jordan Brown said she hopes people will remember what Memorial Day is truly about. Since her husband’s death, the day is even more significant for them. “Now that I have one soldier, it’s so important now,” Jordan Brown said. Dan Brown, 27, of Jerome was killed March 24, 2012 as a result of injuries from an improvised explosive device in Afghanistan’s Kandahar province. “I miss him more than the day I found out,” Jordan Brown said. At the time, their daughters were just three months old. During a March 2012 community event at Jerome City Park to remember their father, the girls slept peacefully in their stroller. Jordan Brown said serving in the Army was the best thing her husband ever did. After high school, Dan Brown worked his way up the ranks to become a sergeant. “God took him too early,” Jordan Brown said. Time has flown over the past year or so since finding out about her husband’s death, Jordan Brown said. “It has been the fastest year of my life,” she said. The widowed mother is working on fixing up a home in Jerome for her and her daughters, Jordan Brown said, and she has a good support system and “such good friends” nearby. Dan Brown’s mother, Becky Brown, said her son joined the Army right after he graduated from Jerome High School in 2003. “He felt like he could make a difference,” she said. When Dan Brown was in high school, representatives from different branches from the armed forces came to talk with students. “He liked what the Army had to offer,” Becky Brown said, so he joined after he graduated from high school. Dan Brown graduated from boot camp in Fort Knox, Kent. After that he was stationed in Colorado Springs, Colo. Within six months of arriving in Colorado, Dan Brown was deployed to Iraq for three months. Then, after spending a year back in Colorado Springs, he was deployed to Iraq for another 13 months. In 2009, he was deployed once again – this time, to Korea. He was there for a year and decided to stay longer. “He liked it there, so he re-upped for another year there,” Becky Brown said. Once Dan Brown got home, he was deployed to Afghanistan in May, 2011. He was killed by an improvised explosive device less than a month before he was supposed to come home. 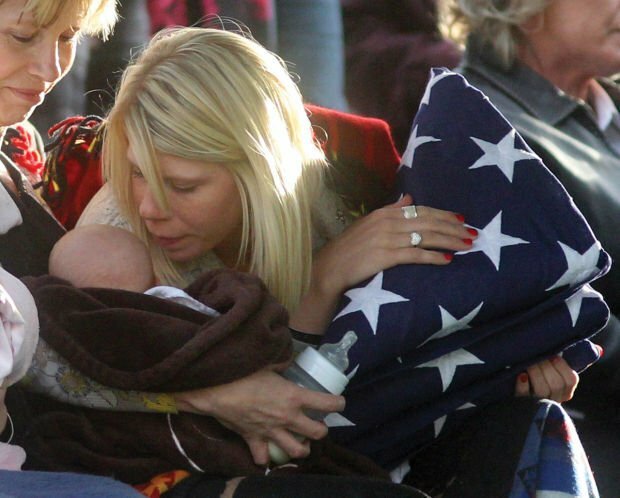 Becky Brown remembers the exact date her son was slated to come home: April 21, 2012. Jordan and Dan Brown’s twin daughters were born Dec. 31, 2011. They were just three months old when their father died. “He never got to see his twins because he didn’t have leave from the time they were born until the time he died,” Becky Brown said. Becky Brown said her son always did the right thing and noted he had lots of friends, was outgoing and fun to be around. Becky Brown said she has always honored members of the armed forces who died for her freedom, but now Memorial Day is even more relevant. “It’s a special day for all of us,” she said. Anna Workman shared her thoughts about Memorial Day and her son, Army Sgt. Chris Workman, 33, Rupert. Workman was killed in a helicopter crash on April 19, 2012 while serving in Afghanistan. It is very difficult to talk about my son, even at this point, one year later. We love our son and miss him very much. Perhaps because it was so sudden, as casualties of war are, or perhaps we just did not realize how dangerous his situation was, we were shocked at his death. I don’t know that there is very much that can prepare a pilot for disorienting dust storms in the dark of a moonless night. He never spoke about his missions or where he was exactly or what the crews were up to. 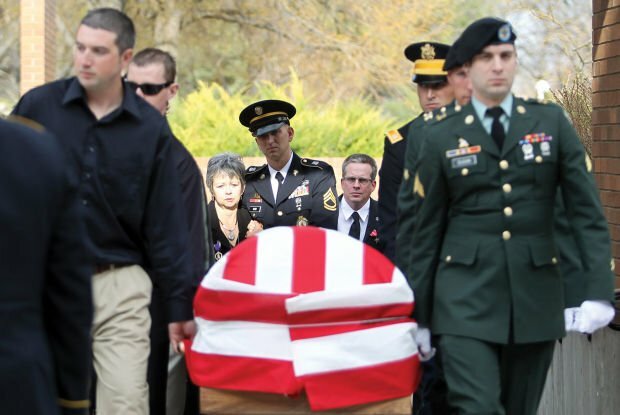 We had many friends whose sons and daughters had been deployed and they had returned to their families. No one ever expects the weather to kill someone in a war zone. I would imagine though, that history shows that the weather is a huge factor during tactical operations of the military. Nevertheless, since we were a non-military family, we were hoping for the best during his deployment and his safe return to us. We hoped that he would have returned and continued his life inconspicuously. We hoped that he would have completed his officer’s training and continued to bigger and better things. We longed for the day that he would have transferred back to the mainland from Hawaii so that he and his family would have been closer to the rest of our family. As a young man, we insisted that Chris go to college and earn a degree. As parents we felt that it was important for his future. When he graduated from I.S.U. with his Bachelor’s in Business, he worked in Boise for several years mostly involved with the real estate business. He did not seem satisfied. He later joined the Idaho National Guard and I believe that event was the beginning of a turning point for him. He had often dreamed of a military career but did not really have the opportunity until after college. In the three short years that he was in the ‘full time’ military, he loved the life, the work, the importance of it, but most of all he loved the camaraderie of his fellow soldiers. He was attached to the 174 Chemical Unit at Scofield Barracks in Hawaii and watched the activities and the busy atmosphere of the 2-25 Light Infantry Unit across the street at Wheeler Air Force Base and finally volunteered to deploy to Afghanistan with them. As Memorial Day approaches, I watch as all the families and communities prepare for the first long weekend of the summer and wonder if they truly understand what it means to be able to do the activities they take for granted. I never realized that most of our national holidays are military oriented. As the flags line the streets and towns, I flash back to our time of sorrow as we buried the remains of our boy. I wonder in 50 years who will know or even care, or if his sacrifice made one drop of difference. I hope the mothers of all the lost children, who cradled their babies in their arms, know that there are many of us and that we will always have holes in our hearts and souls from our missing children. My Platoon was killed by Friendly Fire on 17, May 1969 on Hamburger Hill in the A Shau Valley. About 1 mile from the Laotian Border. The Government covered it up as they said it would not be good for the war effort. At the age of 64 I can see the wisdom of their decision and accept it, because I have to. It doesn't mean I agree or have to like it. But I support our Military. We have to win over there, there is no choice. You have solace of knowing what happened to your loved one. This is a big thing that God has Blessed you with. We, the American People thank and feel for your loss, sincerely. I have never stopped writing about my Platoon and you should never quit writing either. "Lest they forget." My admiration goes out to you. A soldier from a forgotten, unwanted war from many years ago.